What is a “quality decision” and what is the impact of having to define raw data for the process or system? Can raw data be equivalent to complete information and complete data? Should we treat manufacturing “information” and laboratory “data” as the same? In the days of harmonisation of regulations how can we reconcile these differences? This situation is compounded by the failure of EU GMP to define the term “raw data” in the regulations to help industry plan their approach to meeting these regulatory requirements. Especially the Data Integrity Master Class course is directed to participants who have first experiences in Data Integrity, e.g. 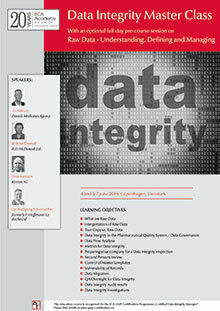 the ECA course “Data Integrity – Requirements for a GMP compliant Data Life Cycle. Translating raw data for a GMP environment: should we treat manufacturing and laboratory the same when it comes to raw data? Using a manufacturing process that is automated by standalone PLCs, PLCs linked to a SCADA system and an automated Manufacturing Execution System, what constitutes raw data will be outlined. Can a True Copy be Raw Data? This brief presentation will start from the definitions of raw data and true copy and explore if and how a true copy can be considered raw data. This workshop is intended to reinforce the two previous presentations. Attendees will be given laboratory, quality assurance and production scenarios to define raw data. Outputs will be discussed with the course.